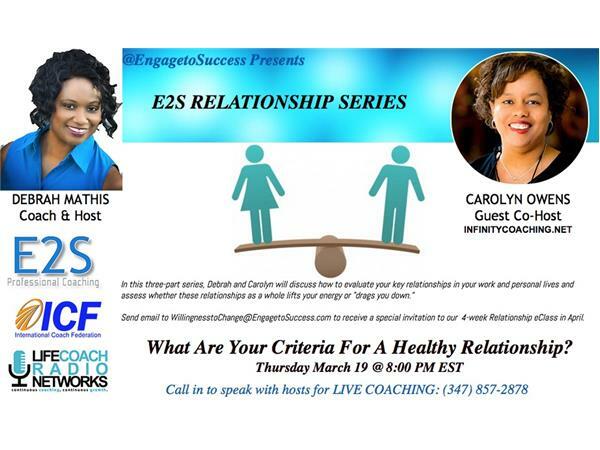 E2S Relationship Series: What Are Your Criteria For A Healthy Relationship? Relationships are such an integral part of our lives, and yet many people go through life without a clear picture of what a good or healthy relationship looks and feels like. So they keep repeating a superficial pattern of attracting people that are out-of-sync with what they really want. Being clear enables you to experience the powerful gift of relationships in all aspects of your life and helps you develop relationships that maintain and grow, are powerful, mutually supportive and uplifting. In this 3-part podcast series, join Debrah Mathis and her guest co-host Carolyn Owens will discuss how relationships are key to our growth & development. Carolyn R. Owens is the Chairwoman and CEO of Infinity Coaching, Inc. Infinity Coaching provides keynote presentations, organizational training, career and life coaching that helps women up-level their skills so they can up-level their income. Prior to staring her career at Infinity Coaching, Carolyn served in the United States Navy, for over 24 years, retiring as a Navy Commander in 2012. Her writing and quotes have been featured in Fox News Magazine Website, Huffington Post, B Woman Magazine, Legacy in the Making Magazine, and many other publications. She has also been featured in various videos including several with with world-renowned life coach Mary Morrisey. Learn more about Carolyn at www.infinitycoaching.net. Debrah Mathis is President/CEO of E2S Solutions Professional Coaching LLC in Dallas, Texas, a world-class, value-driven company that delivers bespoke developmental programs that help you develop a personally effective style of leadership that positively influences and changes not only yourself, but also those with whom you work and interact, and your organization as a whole. As a relationship management strategist, Debrah’s expertise also extends to facilitating change in complex relationships caused by a third party.